It may be so peculiar to hear but the photo slips, screen grabs and info leaks over the web have augmented more credibility to the existence of a new Nokia handset that runs on Android OS. Yes, Nokia will more likely be releasing its very own version of Android smartphone anytime this year. Here's what the recent rumors have on the Finnish firm's newest thought project. Despite being in the final phases of a procurement deal with Microsoft, Nokia appears to be pushing its much-anticipated Android smartphone venture. 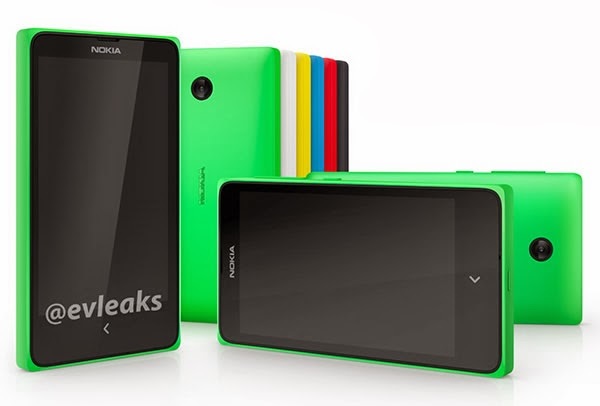 There have been new reports about the recently leaked images, which are believed to be the Nokia X, codenamed Normandy. It’s a new Nokia phone that is ostensibly designed to supplant the old Asha phone series that run Nokia's Series 40 software. And just this week, a Twitter account (@evleaks) is showing some images of what is believed to be the rumored Normandy phone. The said tweet then offered more grounds for mobile analysts to come up with some possible specs to slot in when the new Android Nokia smartphone arrives. The Nokia X phone will reportedly run on an Android 4.4 KitKat platform. And based on the leaked photos, the smartphone will come in six different colors. Basing on the above hardware specs, the unannounced Android Nokia smartphone seems to be heading towards the low-end market. The leaked screenshots from @evleaks have also suggested that the Normandy will showcase a Windows Phone-like user interface. Normandy has had a brief appearance on a Vietnamese online retailer's website before the @evleaks information came out. Most rumors on Nokia Normandy's release are highlighting the 2014 MWC event in Barcelona as the venue for its international debut. A press conference by Nokia is already confirmed for the 24th of February, so let's wait and hear it straight from the Finnish firm to officially endorse the reckoned Android handset, dubbed as the Nokia X.